Caravan members are hungrier, sicker and colder. Although food and clothing have been in short supply throughout the Caravan’s journey, things seem worse here. At Benito Juarez Stadium, where most of the refugees are staying, there is inadequate sanitation and medical care, and the weather is changing, so many will sleep without shelter in the rain tonight. The big NGOs are not here with food or clothing and government officials told us they are only providing enough food for half the people. Since women and children eat first, the men are at risk of literally starving. 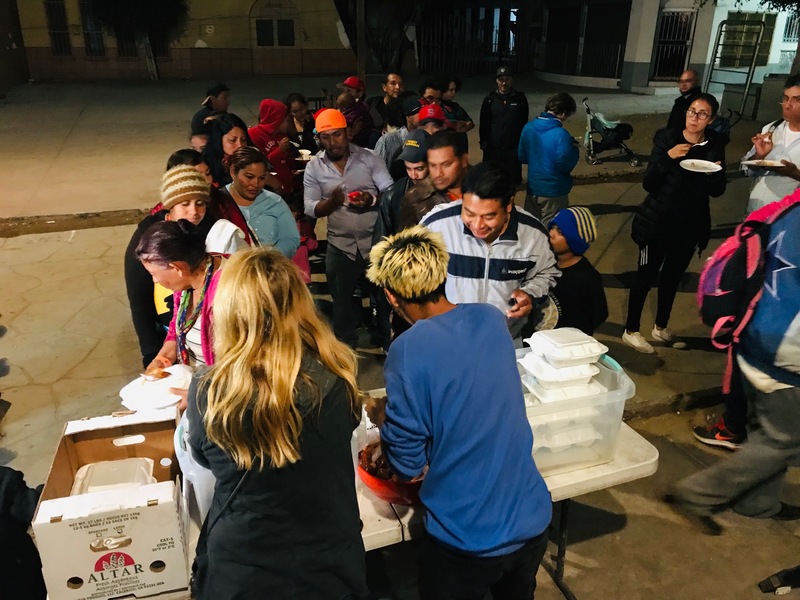 The Caravan members are still relying on the generosity of local Mexicans and a handful of non-Mexican volunteers for their basic needs. Caravan members remain peaceful and polite. In the past few days, Diane and I have helped serve food at Enclave Caracol, an amazing community center that doesn’t turn anyone away (and they need volunteers if you are available!). People wait patiently in long lines for meals, help clean up, help with shopping, express gratitude and humor. 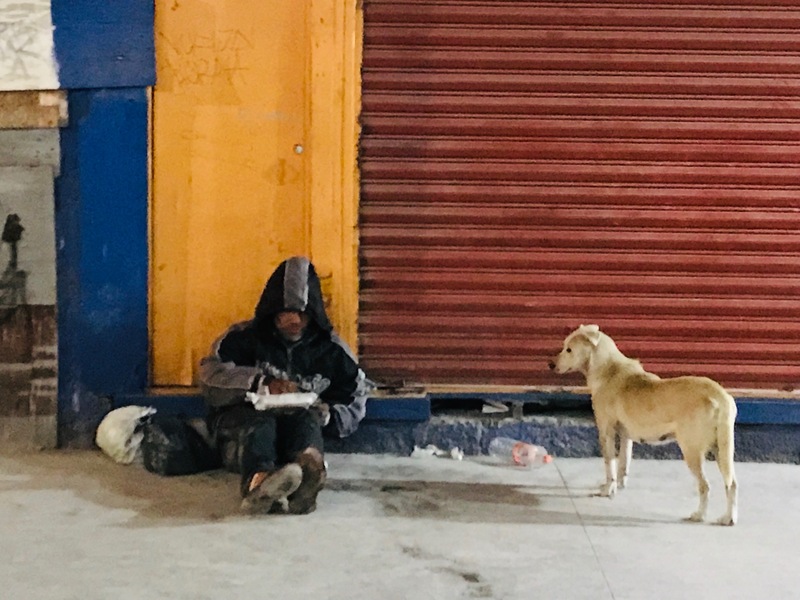 We delivered hundreds of chicken meals twice to Benito Juarez stadium…although things did get a little intense when we arrived for the third time and we had to leave with the chicken. But, as Diane says, the prospect of meat — and missing out — makes hungry people a little crazy. The scuffle at the border? A handful of frustrated people during a very short period of time caused a wildly disproportionate response by US officials and the international media. Things are quiet here now. Although the conditions for serious trouble seem to be building. For many, there is still a feeling of hope. 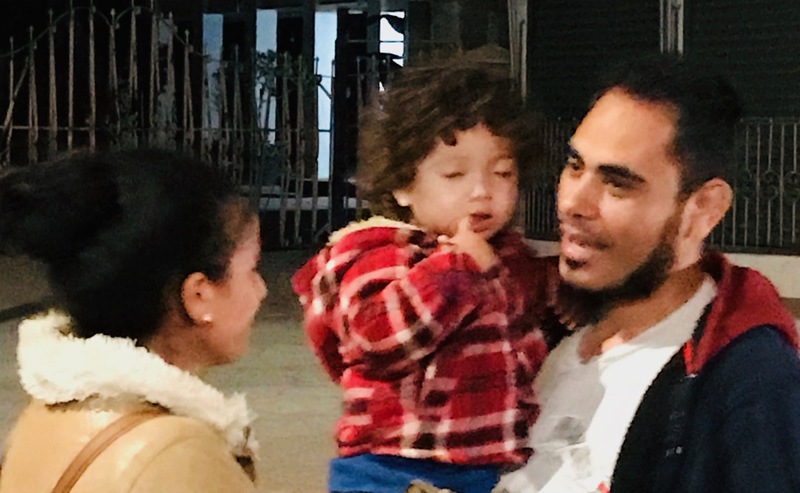 Many of the Caravan members still refer to their faith in god and the United States. For some, even prison (“detention”) in the United States is preferable to the conditions in their home countries. And some are falling in love. Last night, after the excitement with the chicken at Benito Juarez stadium, we headed to Enclave Caracol and found ourselves in the middle of a wedding of 9 couples who met during their journey. That chicken that almost caused a riot at the stadium was a special dinner for the 100 Caravan members who were wedding guests. You are such a Buddha. Keep it going. Are the big ngo’s not there because of a policy reason- e.g. supporting the refugees encourages this type of migration, fear of political backlash of some sort – or because they’re blind? I am assuming it is none of the above but that there are so many crises in the world right now, they just can’t do everything. But a couple of them showed up, did nothing except take photos and then, I suspect, used their “participation” for fundraising. This is my question, too….where are they? They have been strangely silent on this, even those that were so prominent in Greece. I am cynical enough to believe some of them are not interested because there is not much chance they will get large government contracts as they did in Greece. Thank you for all you are doing. This is a great post. Uplifting that these brave people are looking to a better future even if things seem so desperate right now. America needs such resilient and hardworking immigrants – Trump is vile and stupid. Lock him up and open the border! Do have any problem crossing or get backlash from the border patrols? Thank you Jane….No problem going across the border although I am actually living in Mexico for three months so I only crossed the border on foot for Thanksgiving dinner with friends and to replace my lost phone. How is your New new life? Thanks Shawn, there are a few ways people can contribute. Please don’t give to large NGOs because, whatever they are saying, they are not here! 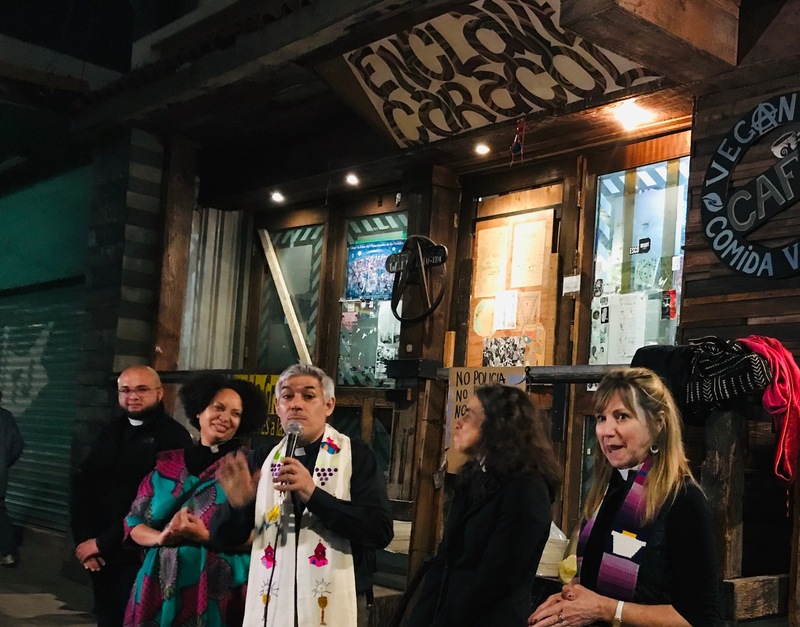 There are some wonderful small organizations in Tijuana struggling to feed and clothe people, and provide legal support, including Enclave Caracol, Al Otro Lado and Border Angels. They all have websites. Or you can support my efforts, which include no overheads of any kind. Every dime I raise goes to food, shoes, socks, and hygiene products. I pay all of my own expenses. Paypal is kimm711@msn.com. Gracias! So deeply appreciative of your loving efforts and grateful for your updates. And oh my goodness… the weddings! Thanks so much Scott! As for resilience, I am in the middle of my third cold in three weeks! We have heard here (from migrants themselves) that Tijuana is not really a safe place for migrants. What about for those people you are working with? Hi Gregoire, the new shelter is in a dangerous part of town. There has been a police presence since they arrived so maybe that will make a difference. From what I could tell, the most dangerous element for the migrants, however, is the US Border Patrol and the prospect of lacking medical care and lack of food. 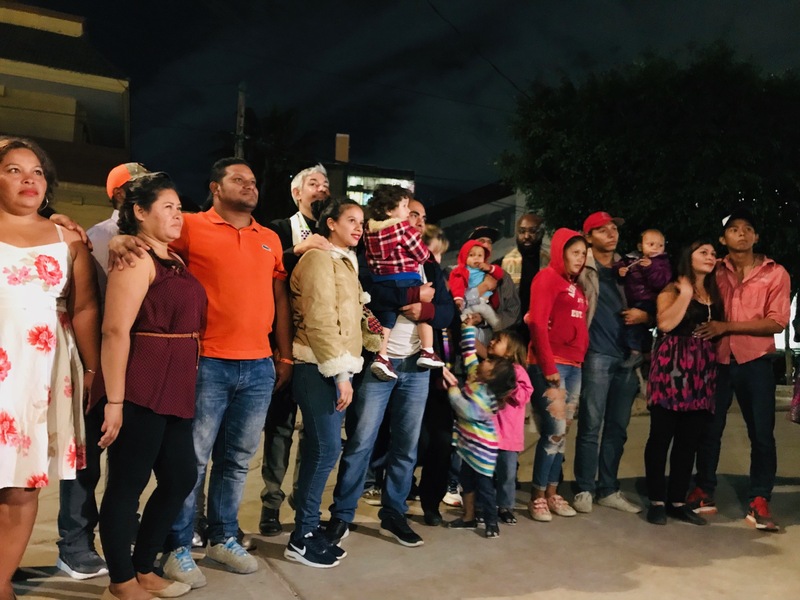 For volunteers, Tijuana is not dangerous for those who are able to stay in safe neighborhoods. Interested in any updates you may have. This is great reporting and I agree that you and Diane are both Bodhisattvas.